Home » About » News » Jean’s Teens and Lin-Wood Public School Present Alice in Wonderland! Monday, October 9, 2017 – Lincoln, NH – FOR IMMEDIATE RELEASE: Jean’s Teens and Lin-Wood Public School Present Alice in Wonderland! This beloved tale is based on the book by Lewis Carroll. A curious young girl follows a white rabbit down a rabbit hole and into Wonderland. There, she encounters some of the strangest and most peculiar creatures, including the Cheshire Cat and the Mad Hatter. Tickets are $15 and may be purchased online at www.JeansPlayhouse.com or over the phone at 603-745-2141. Jean’s Teens is operated in collaboration between Jean’s Playhouse and Lin-Wood Public School. 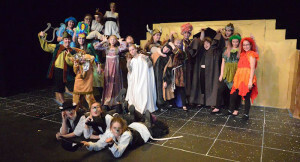 This innovative, professional-level theatre education program offers more than 50 youth from Plymouth, Campton, Lincoln, Woodstock, Littleton and other area towns the opportunity to build their self-confidence, learn new skills, create a sense of team, and participate in plays and musicals with their peers every spring and fall! Alice in Wonderland is sponsored by: Susan & Donald Babson Trust, Dead River Company, New Hampshire Electric Co-op Foundation and Price Chopper.